There are a few types of movies that I don’t like: movies about animals, movies about babies, slasher movies, and movies about boats. There is another type of movie that I don’t want to like, but I just can’t help it: sports movies. How can you not get fired up by We Are Marshall, Remember the Titans, Miracle, or even Angels in the Outfield? 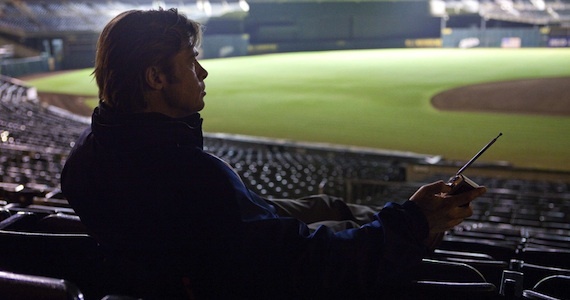 All that to say that Moneyball is the least typical sports movie that I have ever seen, but I like it very much. I like movies or television shows that are about change and the difficulty that human beings have with change. This is why I like The Queen, Downton Abby, The King’s Speech, Toy Story, The Matrix, Driving Miss Daisy, and Metropolis. Moneyball is much more about change than is it about the triumph over adversity portrayed in most sports movies. The film’s lead character, Billy Beane (played by Brad Pitt), is manager of the Oakland A’s. With the help of Peter Brand (played by Jonah Hill) Billy decides to form a team based on computer-generated analysis. The “We’ve never done it that way” protest is heard loud and clear from numerous characters throughout this movie. I often feel like the one person who says, “Lets try something new,” while everyone else says, “We don’t do it that way.” Perhaps this is why I like characters like Billy Beane. When I meet Billy on the screen, I find that I am not the only one who knows that change is good. And then I also know that there there are a million other people who watched this movies who also feel the same way. What is this aversion to change to which so many people cling? Change is natural and necessary. We acknowledge this necessity and celebrate the instigators of change in hindsight. When they are pushing us into uncharted territory, though, we call them heretics and villains. It is a shame that we can’t always applaud initiators of change. How can you not like movies with cute little babies? Or movies where animals can talk!? Insane. Unfortunately, change is a hard thing due to tradition. People like the traditional way of doing things. They like to stay in their (and I hate this phrase) ‘comfort zone’. Change scares people. Maybe its a fear of failure? What if the change being made ends up hurting more than helping. Change is necessary. Unfortunately, its not viewed as such. I also liked how this movie focused on family. Beane was dedicated to his daughter. He didn’t take the big money from the Red Sox and one of the reasons being he didn’t want to be away from this daughter, the other reason being he didn’t want to make a decision based on money, which is something he’d done in the past. I could talk more about this movie but I also like movies where change is a part of the story line. I think it connects with a lot people who have either experienced change or is going through a change in their life. Because no matter what change affects everyone and is a good unifier of people.